Providing complete wiring systems, custom harness, street rod wiring and more. Ron Francis Wire Works is a great source for your wiring needs. From a simple switch to a complete wiring harness you can get the parts for your Street Rod or Custom Car. 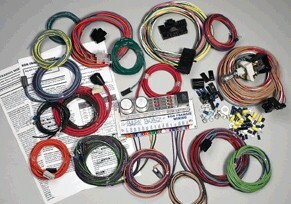 Let us know what type of wiring project you are involved with and we can recommend the correct items to order.